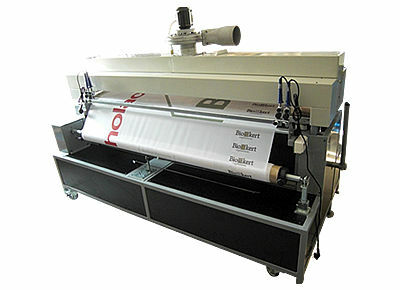 The COLOR FIX machine has been designed for the thermofixing of large format printed fabrics, as well as flags wounded on bobbins. The machine winds the fabric from roll to roll, and during the winding process the fabric receives the heat treatment. In the warm zone, on the printed side of fabric, it is warmed up by heat radiation, on the non printed side by contact heat. Smokes created during the heat treatment process are exhausted by a blower. 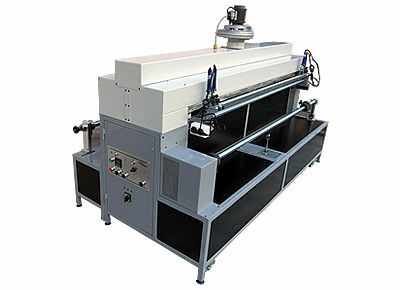 Following the heat treatment, on the upwinding side of the machine, 4 adjustable heatknives - mounted on a rail - melt and cut the polyester fabrics at variable distances.